Anthony Asquith is one of the unsung greats of British cinema, a director whose career began as far back as 1927 and encompassed many notable films (A Cottage on Dartmoor, Pygmalion , Cottage To Let and We Dive At Dawn were all made before the end of the Second World War) as well as forays into the work of Wilde and Rattigan. Asquith's last films were made in the 1960s, when the sun was setting on British cinema, and, as it turned out, on his life and career as well. Even though he was born in Edwardian London, there is something of the Victorian about Asquith- and the latest Odeon Entertainment release, The Woman In Question, does nothing to dispel this. The American title for the film- Five Angles on Murder is perhaps a more appropriate one, and one that might have led to The Woman in Question doing better business at the box-office at the end of 1950. In short, a murder is committed, and we see the recollections of events from at least five different (and overlapping) perspectives. This intriguing structure is deftly created with a mixture of flashbacks interspersed with the police investigation which acts as a motivator for the memories. Although my earlier Victorian comment is borne out in the taut drama that unfolds, the material is at times handled with a light wit, particularly early on. This humour largely revolves around the character of Mrs. Finch (brilliantly portrayed by Hermione Baddeley), who soon gives way to more intensely dark characterisations. The darker mood that predominates as the film goes on is created partly by its performances from a strong cast who instil just the right degree of tension and angst to the situations. Jean Kent (in a tour de force) is supported by Charles Victor (who had previously worked with Asquith on The Way To The Stars in 1945) and a young Dirk Bogarde, who had caught the public eye with a strikingly serious performance in The Blue Lamp, released earlier in 1950. Indeed, Bogarde's versatility is seen in evidence here as his character Bob Baker is more of an enigma than some of the others- a mist of secrecy surrounds much of the character's background, even down to the pretence of his Transatlantic accent. One of the most annoying things about British film is that there is an oft-cited nominal list of "cult" or "great films" (ranging from Brighton Rock to Get Carter) which often seems to preclude other 'new entries' from being considered even in the same breath. The Woman in Question, though, is an excellent film- and one that should sit quite happily with the best of postwar British cinema. One of the film's central issues- that a person can be viewed quite differently by several of their friends or acquaintances- is a highly intelligent one, and therefore offers food for thought beyond the running time of the film's narrative. It is to be hoped that the excellent work Odeon Entertainment is doing raises the profile of solid British talent, from actors to directors like Anthony Asquith, who deserve wider acclaim and recognition. 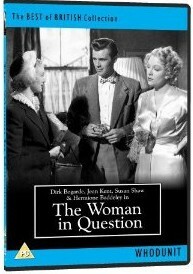 The Woman in Question is available on DVD from Odeon Entertainment.